Ciao royals! Today’s lesson is about morning rituals, how they impact your well being, how to use morning rituals to improve your life, and what yours could include! To begin, what is a morning ritual? Well a morning ritual is anything you do every morning as part of your morning routine. Morning routines and rituals are very important to your wellbeing. They have huge impacts on how your day will go, the mindset you will be in, and possibly can affect your whole week. So how do we go about royal-ifying our morning routine/ritual?? -Leave yourself time. If you have to go to an appointment at 11, wake up at 8. If you have to go to class at 10, wake up early. Don’t wake up last minute and have to rush- this will set the tone for your day. -As soon as you wake up, drink a glass of lemon infused water. The water will help any dehydration you may have gotten in your sleep (especially if you’re like me and have a bad habit of sleeping with your mouth open). The lemon is a natural detoxifier and will just also help to add taste to the water, not to mention it will kickstart your metabolism for the day. -Don’t sit in bed. While it may be tempting, especially when your bed is warm and the outside is cold, make sure you wake up, and get up immediately. Setting your body in motion first thing in the morning will really help make your wakeup so much easier. -Start the day with a good attitude. Maybe make your alarm a nice song. Or hug a plushie when you first wake up. Or let natural light wake you. Whatever it takes for you to start your day off happily. -Make an upbeat playlist to play while you get ready. Listening to uplifting or upbeat music in the morning will put you in the right mindset for the day! -Prepare your bag the night before. If you still go to school, put the items that you need for your classes into your bag the night before, so that you will not have to stress about it in the morning. -Have fun with it. Spend a little extra time lovingly picking that favorite perfume, or carefully coordinating an outfit that shows your personality. Maybe arrange your hair in a special style or match your accessories to your eyes. The choice is yours, but I find that dressing up a little and being really particular in the fashion choices I make, makes me really happy and excited for the day. -Reflect on your dreams. Think about what they might mean, maybe write them down. Reflect on how they made you feel. NOTE- disregard this if you had nightmares. Never dwell on nightmares if you can help it. -Envision the day ahead. Identify your worries and try to find reasons to be calm about them. Picture yourself having the perfect day. What would your perfect day look like? What attitude would you have on your perfect day? Try to keep this in mind all day, but remember, even if your day doesn’t follow that path, it can still be a good day. Keep a good attitude all day. -Repeat some self-affirmation statements. Look in a mirror and compliment yourself. Find one aspect of your personality that you like and focus on it. Remind yourself that you will make it through the day no matter what happens during it. 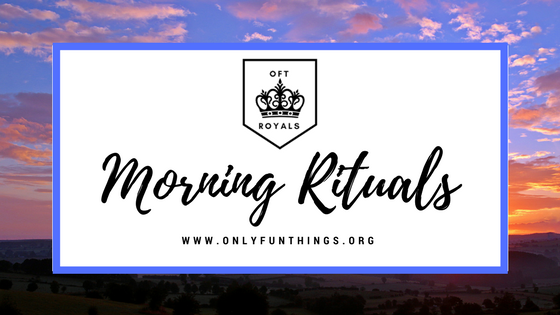 Morning routines can be integral to a Royal’s entire week. Starting your day off right means a good attitude all day. And that’s very important. Lovely post! I definitely need to be more mindful in the mornings myself. When the weather gets warmer I was thinking about going for walks in the morning, but then I'd have to wake up early...and that is.... a struggle for me. On the other hand I'm sure it would do good to get some fresh air and exercise first thing in the morning! Do you think you'll make a post about nighttime/bedtime routines as well? I’m actually working on a night time routine post now! I hope to have it out by next week’s royals post day! I definitely think a walk in the morning would be a great idea. I would probably do that myself, once it warms up here a little!